Cairngorm corries are generally big and wide, spacious curving bowls carved out of the mountainside and visible from afar. Coire Garbhlach is different. 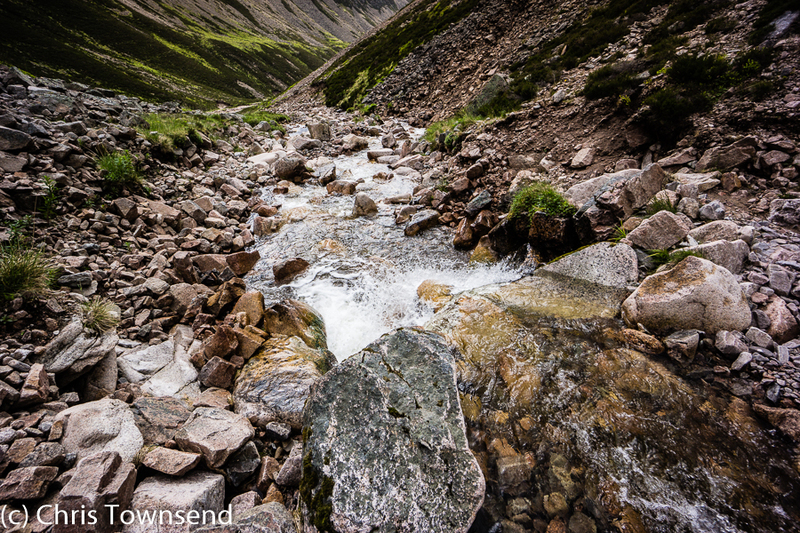 Coire Garbhlach is narrow, twisting and hidden, more of a canyon than a coire, a deep cut gouged deep into the hills. A side valley of Glen Feshie it's passed by many walkers. Few ever venture into though. That I think is because from below, from the path that crosses the Allt Garbhlach on its way up Glen Feshie it doesn't look special or even very interesting. That's because you can't really see it. You're only looking at its mouth, a green V between steep slopes. Venture through that V and a marvellous hidden world is revealed. With rain and high winds continuing a day on the tops didn't seem appealing so I decided to visit Coire Garbhlach again during a short gap between much desk work and many indoor meetings. This was the first time I'd been there since winter floods had ripped out the path at the confluence of the Allt Garbhlach with the River Feshie and I wondered what I'd see upstream. Following the burn is hard work, not due to the angle, which is gentle, but due to the terrain, a mass of heather tussocks and boggy grass. Often I followed the banks of stones lining the stream, finding wobbling over these loose rocks easier than fighting through the vegetation above. In many places big sections of the hillside had collapsed and there was much loose rubble. There's no path, just a few sketchy deer tracks. With no rain since the previous day the burn wasn't in spate though it was still deep and fast, roaring noisily down the canyon. There were many flowers on the banks - tormentil, butterwort, violets, daisies, buttercups, lady's smock, moss campion and more. Grey wagtails and dippers darted along the waters edge. A deer watched me from above, probably startled to see a human here. Once round the first curve in the canyon the outside world vanishes. 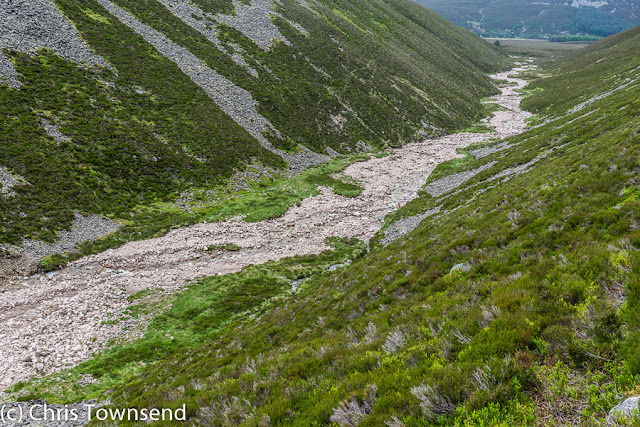 Glen Feshie is gone, the summits above hidden. This feels a closed-in, secretive place. I wandered as a far as a fine waterfall then sat and watched the water, mesmerised by the delicate yet powerful torrent and the constant sparkling of the falling drops. 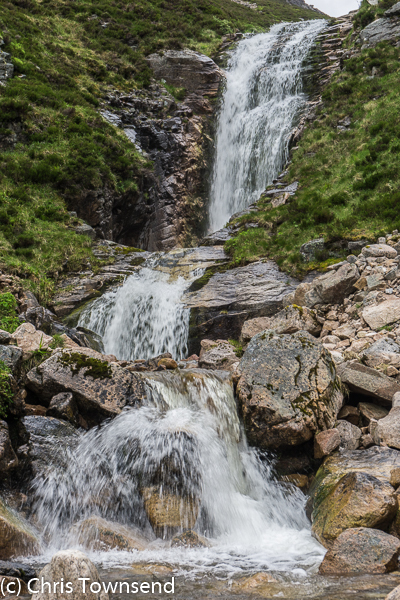 Above these falls the canyon splits in two and ends in steep stony slopes rising up to the Moine Mhor. 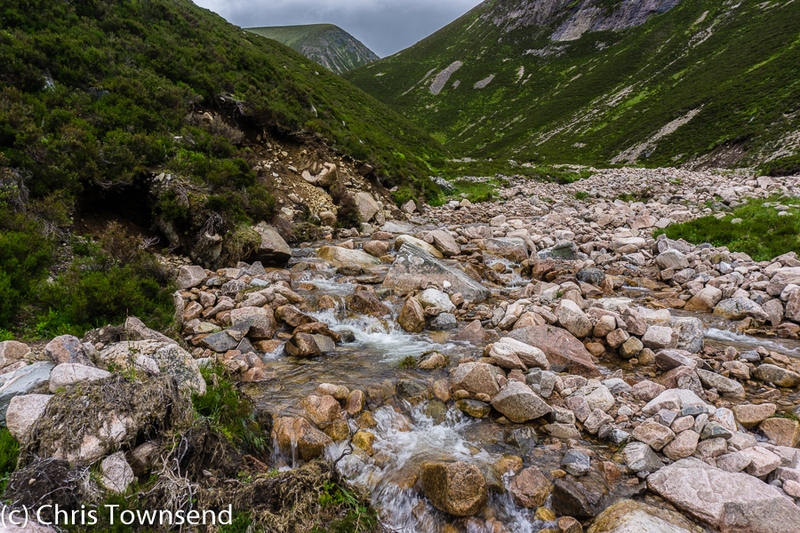 With no time to climb these this day I turned and descended back to the open space of Glen Feshie, refreshed and content. Wow, thank you for bring this treasure of nature to us! Just as you said.. one could easily miss this beauty thinking there's nothing interesting to see. Will add this to our bucketlist! Glad to have found your site and will be coming back for more refreshing posts.